Sherry Huss is vice president of Maker Media and co-creator of the beloved Maker Faire. Her vision and passion for the maker movement is instrumental in growing the Make: brand within the maker ecosystem. Sherry brings over 20 years of product marketing and event experience to the team, joining Make: after holding senior management positions at MediaLive International, Key3Media, Ziff-Davis, and Softbank. Before Maker Faire, Sherry was instrumental in launching and managing successful technology and consumer events such as Sun’s JavaOne, Oracle’s iDevelop, O’Reilly Media’s Web 2.0 Summit and Dwell on Design. When not in the office, Sherry and her husband enjoy exploring the maker scene around the world and seeking out exceptional cuisine. Maker Trivia: Sherry co-owns Renga Arts, a company dedicated to functional art made from reclaimed, repurposed and recycled items. Tom di Maria has served as Creative Growth Art Center’s Director since 2000. As Director, he has developed partnerships with museums, galleries and international design companies to help bring Creative Growth's artists with varying abilities fully into the contemporary art world. He speaks around the world about the Center’s major artists and their relationship to what art critics refer to as Outsider Art, that is, art that is not within art institutional favor and outside hegemonic/dominant contemporary cultural values. Prior to this position, he served as Assistant Director of the Berkeley Art Museum/Pacific Film Archive, at UC Berkeley. Tom has also worked as the Executive Director of FRAMELINE, and as Director of Development and Marketing at the San Francisco Film Society. He holds a B.F.A. from Rochester Institute of Technology and a M.F.A. from Maryland Institute, College of Art, in film and photography. Tom is also an award-winning filmmaker, with short film awards from Sundance, Black Maria, Sinking Creek, National Educational Media, and New York Experimental film festivals. Tim Rollins (b. 1955, Pittsfield, Maine) studied fine art at the University of Maine and earned a BFA from the School of Visual Arts in New York. After graduate studies in art education and philosophy at New York University, Rollins began teaching art for special education middle school students in a South Bronx public school. In 1984, he launched the Art and Knowledge Workshop in the Bronx together with a group of at-risk students who called themselves K.O.S. (Kids of Survival). In 1997, the documentary, Kids of Survival: The Art and Life of Tim Rollins & K.O.S. was widely received at the London Film Festival, Cinema de Real, France and the Hamptons International Film Festival. Since its inception, the group has exhibited extensively worldwide including a recent solo exhibition at the Savannah College of Art and Design’s Museum of Art, Savannah, GA, in 2014. Additional exhibitions include presentations at the Studio Museum, Harlem (2013); Hayward Gallery, London (2012); Museum fur Gegenwartskunst, Basel (2012); Galleria d’Arte Moderna e Contemporanea, Bergamo, Italy (2011); the Smithsonian American Art Museum, Washington D.C. (2011); and the Whitney Biennial (2006). A retrospective of the group’s 20-year career opened at the Tang Teaching Museum and Art Gallery at Skidmore College in 2009 and travelled to the Frye Museum in Seattle and the ICA Philadelphia later that year. A fully illustrated hardcover catalogue, co-published by the Tang Museum and MIT Press, accompanied the exhibition. The group’s work is represented in nearly 100 prestigious public collections, including the Museum of Modern Art, New York; Hirshhorn Museum of Art, Washington D.C.; Tate Modern, London; Smithsonian Museum of American Art, Washington D.C. and Dallas Museum of Art, Texas, among others. 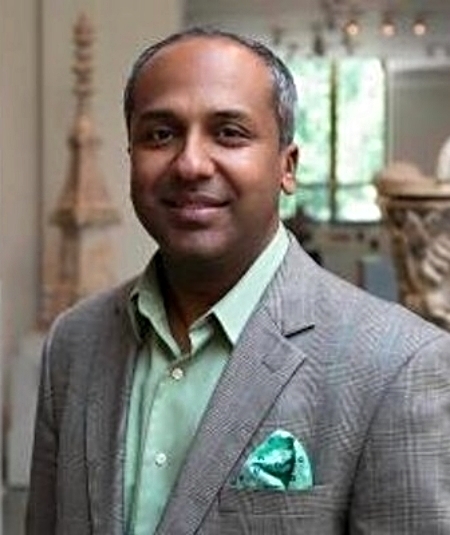 Sree Sreenivasan (@sree) is the first Chief Digital Officer at The Metropolitan Museum of Art. At the Met, he leads a 70-person world-class team on topics he loves: digital, social, mobile, video, apps, email, interactives, data and more. He joined the Met in 2013 after spending 20+ years at Columbia University as a full-time professor at Columbia Journalism School and a year as the university's first Chief Digital Officer. In 2009, he was named one of AdAge's 25 media people to follow on Twitter; in 2010 was named one of Poynter's 35 most influential people in social media; and in 2014, was named one of the most influential Chief Digital Officers by CDO Club.